What would happen if a government committed to green policies and animal rights principles were elected, and had the will and determination to carry them through? Like a Green Taliban, only better organised and with the resources of a modern state at their disposal. In Shades of Green, that’s just what happens. Against a background of continued economic flat-lining, a series of environmental crises propel Don Mason’s Green Earth Movement into government. Their ‘Green Revolution’ puts tens of thousands of Green Volunteers onto the streets, climate change projects launched to transform the economy, eco-criminals hauled off to eco-camps for re-education and every aspect of society examined for its environmental virtue. As the initial wave of euphoria subsides, Mason’s government moves towards ever harsher measures to reduce the impact of humanity on the natural world. Caught in the middle of this are the ‘Kitson Circle’, led by the ambitious Liberal-Green politician Peter Kitson. As a compromise between prosperity and environmental virtue becomes ever more elusive, Kitson and his family find themselves at the mercy of forces they cannot control. 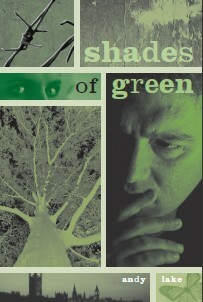 With Britain’s first ‘Green King’ and a conservative US President playing pivotal roles, Shades of Green has a cast of memorable characters caught up in the events at the centre of this challenging and politically incorrect novel.